It is reasonable to expect that the frequency range (i.e., bandwidth) required for a given transmission should depend on the Bandwidth Usage occupied by the modulation signals themselves. A high-fidelity audio signal requires a range of 50 to 15,000 Hz, but a bandwidth of 300 to 3400 Hz is adequate for a telephone conversation. When a carrier has been similarly modulated with each, a greater bandwidth will be required for the high-fidelity (hi-fi) transmission. At this point, it is worth noting that the transmitted Bandwidth Usage not be exactly the same as the bandwidth of the original signal, for reasons connected with the properties of the modulating systems. If the voltage waveform described by this expression were applied to the verti­cal input of an oscilloscope, a sine wave would be displayed on the CRT screen. The symbol f in Equation (1-1) represents the frequency of the sine wave signal. Next we will review the Fourier series, which is used to express periodic time functions in the frequency domain, and the Fourier transform, which is used to express nonperiodic time domain functions in the frequency domain. To expand upon the topic of bandwidth requirements, we will define the terms of the expressions and provide examples so that these topics can be clearly understood. A periodic waveform has amplitude and repeats itself during a specific time period T. Some examples of waveforms are sine, square, rectangular, triangular, and sawtooth. 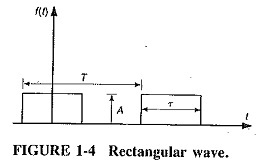 Figure 1-4 is an example of a rectangular wave, where A designates ampli­tude, T represents time, and τ indicates pulse width. This simplified review of the Fourier series is meant to reacquaint the student with the basics. Equation (1-4) supports the statement The makeup of a square or rectangular wave is the sum of (harmonics) the sine wave components at various amplitudes. If any nonsinusoidal waves, such as square waves, are to be transmitted by a communi­cations system, then it is important to realize that each such wave may be broken down into its component sine waves. The Bandwidth Usage will therefore he considerably greater than might have been expected if only the repetition rate of such a wave had been taken into account. It may be shown that any nonsinusoidal, single-valued repetitive waveform consists of sine waves and/or cosine waves. The frequency of the lowest-frequency, or fundamental, sine wave is equal to the repetition rate of the nonsinusoidal waveform, and all others are harmonics of the fundamental. There are an infinite number of such harmonics. Some non-sine wave recurring at a rate of 200 times per second will consist of a 200-Hz fundamental sine wave, and harmonics at 400, 600 and 800 Hz, and so on. For some waveforms only the even (or perhaps only the odd) harmonics will be pres­ent. As a general rule, it may be added that the higher the harmonic, the lower its energy level, so that in bandwidth calculations the highest harmonics are often ignored. The preceding statement may be verified in any one of three different ways. It may be proved mathematically by Fourier analysis; Graphical synthesis may be used. In this case adding the appropriate sine-wave components, taken from a formula derived by Fourier analysis, demonstrates the truth of the statement. An added advantage of this method is that it makes it possible for us to see the effect on the overall waveform because of the absence of some of the components (for instance, the higher harmonics). In each case several of the harmonics will be required, in addition to the fundamental frequency, if the wave is to be represented adequately, (i.e., with acceptably low distortion). This, of course, will greatly increase the Bandwidth Usage.